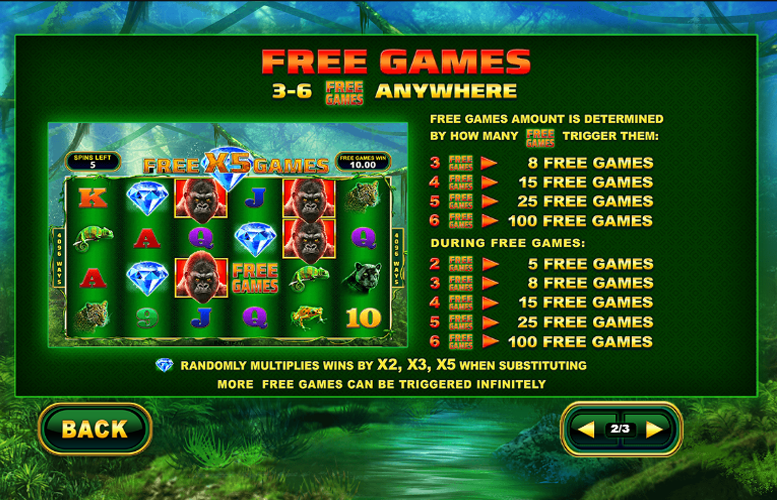 The Epic Ape slot machine takes players deep into the rainforest for an exotic adventure that could result in some massive cash prizes. The game offers players the chance to win up to 100 free spins and these can be retriggered multiple times. What’s more players can also hit multipliers during these spins that can make it even more lucrative. Let’s take a closer look at some of its specifics. Potentially unlimited free spins mode. Even if they do come to an end, the possibility to win 100 more free spins excites us. This is a rarity on online slots. Nice look and feel. The Epic Ape slot takes players to the heart of the jungle, and the sights and sounds are all authentic, further adding to a great atmosphere. It’s all about the free spins. Some players won’t appreciate this and prefer greater diversity with their bonus features. Ape = 300x the line bet. Panther or Leopard = 250x the line bet. Chameleon or Frog = 200x the line bet. Two symbols = 5 Free Games. Players should note that free games can be triggered infinitely. The diamond “wild” symbol can substitute for all other symbols except the “free games” one. When this forms part of a winning combination, it can also randomly multiply the winnings by 2x, 3x, or 5x during the free games mode. As well as being the title star of Epic Ape and the highest paying symbol on the game, the ape icon also appears stacked on all reels. This substantially increases the likelihood of a player dropping a large win. 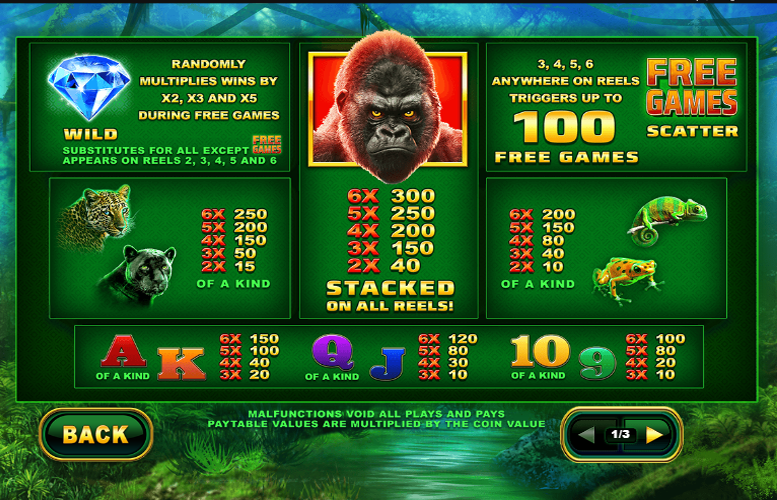 Rather than using traditional win lines, the Epic Ape slot machine instead favours a “ways to win” system. 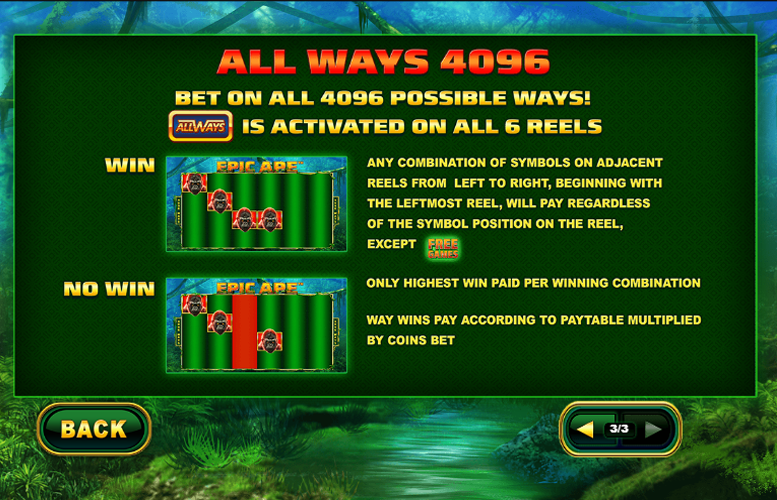 This means that matching symbols in any position on consecutive reels will trigger wins. Queen or Jack = 120x the line bet. 10 or 9 = 100x the line bet. Since Epic Ape uses a “ways to win” system in favour of win lines, players cannot adjust the number of lines played per spin. However, in terms of pricing, the slot plays as if there were 40 win lines active at once. Players can only adjust the coin value on each spin. Here, the lowest value is just 1p and the highest is £2. This makes the minimum bet per spin just 40p and the maximum a somewhat underwhelming £80. Granted, most players won’t be discouraged by this upper betting limit. However, some high rollers might pass on Epic Ape based on it. 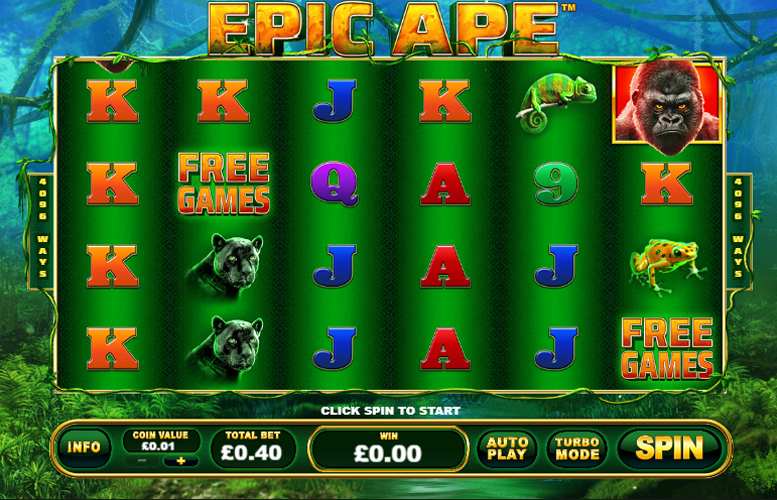 The Epic Ape slot machine from Playtech will certainly appeal to a great many players. Firstly, it has a solid theme and the tasteful art style complement this well. Next there is the fact that players can win up to 100 free spins during the base game. What’s more, these can be retriggered infinitely. Add on the occasional multiplier during free spins and this bonus could be incredibly lucrative. Unfortunately, that’s pretty much all the game has got to offer. For fans of diverse bonus features, the gameplay might get stale quickly. This game has a rating of 4 / 5 with 284 total reviews by the users.